Ellie Mae is a somewhat stereotypical country person appearing in The Super Mario Bros. Super Show! In The Super Mario Bros. Super Show! episode "Mario Hillbillies", Ellie Mae, needing a new faucet, goes to Mario Brothers Plumbing seeking to get one from Mario and Luigi. Upon entering Mario Brothers Plumbing, Ellie Mae encounters Mario Joe and Luigi Bob, Mario and Luigi's cousins. Asking Mario Joe and Luigi Bob if they have a faucet, Ellie Mae is dismayed to hear Mario Joe say that he is not sure. Deciding to try and cheer Ellie Mae up, Mario Joe tells Ellie Mae not to worry; Hearing this, Ellie Mae decides to introduce herself to Mario Joe and Luigi Bob and proceeds to ask their names; at first stumbling over his words, Luigi Bob introduces himself to Ellie Mae as Luigi, likewise, Mario Joe introduces himself as Mario. After introductions are done, Ellie Mae says that she is glad to be getting plumbing help from Mario Joe and Luigi Bob, who she says are country bumpkins. Later on, as Mario Joe and Luigi Bob begin to try and carry various plumbing tools, as well as toolbelts, Ellie Mae plays with the Ratigator, who she describes as cute. Asking what the Ratigator's name was, Ellie Mae gets the response from Mario Joe and Luigi Bob that he is named Zeke and Luke; as Mario Joe and Luigi Bob still try to handle their plumbing tools, Ellie Mae begins to doubt their abilities, to which Mario Joe and Luigi Bob respond to by reassuring Ellie Mae and claiming it is an honor to fix her plumbing. Charmed by Mario Joe and Luigi Bob, Ellie Mae decides to keep Mario Joe and Luigi Bob over at her house for possum dinner after they fixed their plumbing. Excited by the prospect of possum dinner, Mario Joe and Luigi Bob promptly leave Mario Brothers Plumbing with Ellie Mae, who decides to make Mario Joe and Luigi Bob a snack. 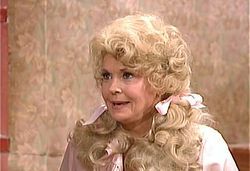 The character Ellie Mae is based on Elly May Clampett from the TV sitcom The Beverly Hillbillies, while also being portrayed by the same actress, Donna Douglas. This page was last edited on February 11, 2019, at 03:30.